The forestry industry is an important contributor to the BC economy. But our forests are much more than timber to be logged for profit and tax revenue. Excessive human activity, pests, disease, and fire have drastically reduced the timber supply in BC. So harvesting is now occurring deep in community watersheds and much nearer to communities. This has damaged a wide range of non-timber values, including wildlife, water quality, tourism, and recreation. As BC’s timber supply dwindles, there has been a corresponding public outcry to the increasing social and economic cost of timber harvesting. This resulted in the BC government’s review of how the provincial resource management process and governance. Our immediate goal is to ensure the review of Professional Reliance launched by the BC government results in a thorough revision of the Forest Range & Practices Act (FRPA). Key to this revision is the elimination of the current exclusive license of industry employees (Registered Professional Foresters) to draw up logging plans for their industry employers, while at the same time being responsible for protecting BC’s non-timber values. This conflict of interest is currently enshrined within a regulatory framework with no mandatory consultation or approval by the very communities and local businesses most impacted by the forest industry’s activities. Therefore an initial aim of the BC Coalition for Forestry Reform is to assist communities in BC to get directly involved in pressuring the BC government to create the resource regulation and policies needed to ensure local communities have a strong and effective voice in forestry planning and management. Major changes in forest policy were brought into effect over a decade ago. Suddenly natural resource management and environmental protection laws were cut back at least a third, while the indispensable task of government oversight of logging operations was withdrawn. In it place a policy was adopted called Results Based Forestry, the principal strategy of which was to transfer the discretionary power over logging plans to Registered Professional Foresters (RPFs) who are hired by the harvest license holders — mainly private companies and First Nations bands. This new “streamlined” policy became known as Professional Reliance. What professional reliance means in practice is that industry employees who are extracting timber value for their employer are also given responsibility for “protecting” the non-timber values of BC’s forests. From the onset, this conflict of interest has been an obvious concern. In the event that the broad — some would say far too general — regulations to protect non-timber values were not met, concerned citizens could appeal to the government agency Compliance and Enforcement Program. But experience soon confirmed that C&E has very little power. Communities turned to the Forest Practices Board, but there as well the power to do anything was severely limited. In extreme cases, one could complain to the Association of Registered Professional Foresters about work of the local company’s RPF. But this avenue ran the severe risk of making enemies within your own community. We are now waiting for the provincial government to take action on implementing the recommendations of the Final Report. The situations described by the Board occur in part because of the lack of Ministry authority over forest operations discussed above. The Ministry has for many years tried to address these issues by developing a Cumulative Effects Framework. However, implementation of the framework requires greater government authority, greater willingness to use existing tools (such as objectives set by government), and commitment to land use planning. We compared the recommendations contained in our submission to the PR Review against the recommendations of the Final Report. We are encouraged that the majority of our concerns have been recognized and either wholly or partially addressed by the recommendations of the Final Report. The BCCFR’s mission and focus is to give BC’s rural communities greater input and control over how forestry planning, management, and harvesting impacts the local environment, economy, and lifestyle. In the following analysis, for each BCCFR recommendations we list the corresponding recommendations from the Final Report. Recommendations we consider critical for immediate implementation are highlighted in green. BCCFR Recommendation #1: Forest development must be managed according to publicly available, long-term, landscape-level planning, to include a mandatory shared decision-making process with local communities. R22. Improve opportunities for addressing third party concerns and dispute resolution. R24. Modernize land use planning in partnership with Indigenous governments and communities. R25. Develop means to address capacity to engage in resource management processes. R26. Consider engaging Indigenous governments and communities in compliance and enforcement. R29. Include the public in processes that address natural resource management objectives and land use. R30. Improve public notification systems. BCCFR Recommendation #2: Full recognition of the timber and non-timber values of our forests including water, wildlife habitat, biodiversity, tourism, and recreation. R8.Restore and clarify government authority to make resource management and environmental protection decisions. R28. Make natural resource information more consistently available. R33. Identify opportunities to improve the quality of natural resource information to help improve professional reliance outcomes. R87. Enhance decision maker authority by amending the approval test to include consideration of government’s objectives, Indigenous governments and communities’ interests, other rights holders (Crown tenure holders and landowners) and the public interest. R89. Improve minister’s authority to make GAR Orders: review the limitations on the minister’s authority to make orders to protect non-timber values. BCCFR Recommendation #3: The restoration of clear government discretionary powers with regard to approval of logging plans and practices, including an improved Forest Practices Code and accompanying guidelines. R5. Review regulations and authorizations to ensure that government’s resource management objectives are adequately expressed and made known to professionals. … The need for clear objectives is more pronounced for broadly based resource activities such as forestry. R10. Ensure that government has authority to address problems when they arise. R11. Review regulations, authorizations, Ministry policies and professional codes of ethics to ensure that conflicts of interest are properly disclosed and addressed. R92. Remove compliance certification by professionals. R93. Professional Certifications and Assurance Statements. R112. Improve accountability to government: Provide provincial authority to reject riparian assessments that do not follow the prescribed methodology, are carried out by unqualified individuals, or where the professional’s opinion concerning the streamside protection and enhancement area is not supported by the facts or adequately justified. BCCFR Recommendation #4: Full recognition and guidance of forestry planning on the basis of scientific data. Full recognition, for example, of global warming and adjustment of forest policies accordingly. R3. Review regulations and authorizations to ensure that competency requirements are aligned with the professional task or function. R6. Government and professional organizations should collaborate to identify opportunities and prioritize needs for developing guidance to professionals through practice standards and guidelines. … clarify expectations and enhance enforcement. R7. Government should provide greater guidance concerning activities that require multi- disciplinary expertise. … more than one type of expertise to inform sound decision-making. … [prevent] questionable opinions from professionals who are actually unqualified even though they might meet the generic legal requirements of the definition of qualified professional in the regulation. R9. Ensure that regulations and authorizations include authority to obtain and question information provided by qualified professionals (or a proponent), so agencies can carry out their regulatory role appropriately. R12. Identify ways to promote and ensure professional independence. R13. Expand requirements for proponent adherence to professional advice. R14. Consider alternatives to proponent selection of professional experts. R15. Improve and standardize requirements for professional documentation and rationale. R16. Expand the use of professional certifications and assurance statements. R17. Introduce requirements to ensure that professional work is current and relevant. R90. Improve documentation and rationale: … forest plans should include a systematic, transparent and well- documented decision-making process that shows appropriate consideration of the potential impacts of harvesting, silviculture systems and roads to public and third-party interests, including documentation of the professional advice received and how it was considered. R91. Clarify professional tasks and qualifications: given the multidisciplinary nature and forest resource management, the regulation should specify the qualifications required for certain professional tasks. BCCFR Recommendation #5: A vigilant monitoring system, well budgeted and independent of industry control, with particular attention given to riparian zones and roads. Consider establishing an Office of Professional Regulation and Oversight (the “Office”), which would be an agent of government focused on professional organization governance issues and independent from natural resource sector ministries. … Be an agent of government, independent of oversight from natural resource ministries. R18. Develop auditing programs for professional work product. R20. Improve accountability through new liability mechanisms. R21. Strengthen monitoring programs and consider new partnerships to enhance monitoring efforts. R31. Establish an independent review body for natural resource practices and decisions. R32. Standardize standing rules for appeal tribunals to allow for greater public access to remedies. BCCFR Recommendation #6: Staffing levels and budgets adequate to support the proposed changes. R34. Identify opportunities to improve Ministry staffing levels and resources to enhance government oversight. Click on this link (http://world.time.com/timelapse2/) then enter your city, town, or street address in the search field. Zoom out to see the broader impact of the last 32 years of harvesting in your area. 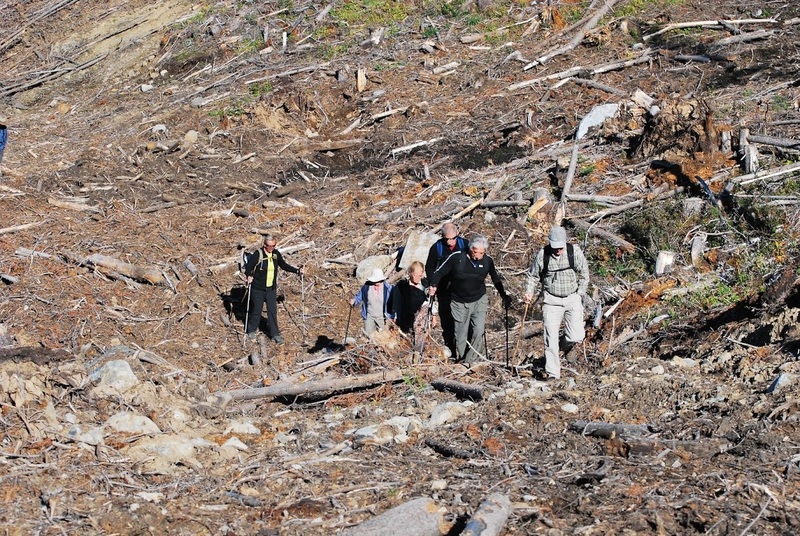 The above interview by Taryn Skalbania, from member organization Peachland Watershed Protection Alliance, outlines the issues with Professional Reliance and current forestry regulation in BC. The above video accurately reflects the experience and frustration every member of BCCFR has experienced when attempting, and failing, to get responsible logging practices done in their local area. NOTE: The first article is written by Mark Haddock, who wrote the Final Report on the government’s professional reliance review. Association of BC Forest Professionals – What is Professional Reliance? We are not exaggerating when we say the many organizations and community members participating in BCCFR have hundreds of years of combined experience dealing with forestry regulation, complaints, negotiations, government officials, Registered Professional Foresters, and harvest licence holders. Individuals and organizations that are aligned with the BCCFR mission are encourage to join the coalition. Click on the link below to submit your application. We will use our experience to help you get your voice heard! The BCCFR is cooperative group of individuals, community organizations, and non-profits. We are not currently incorporated as a separate non-profit organization. However, we do incur expenses, and very much appreciate your financial support.